I reluctantly admit, I am not one for licorice, as the flavor disgusts me. Imagine when I learned that the fennel seeds in Italian Sausage come from a plant that gives off a similar scent/taste to licorice. We love Italian Sausage in our home, especially sweet Italian Sausage, which has basil in it. 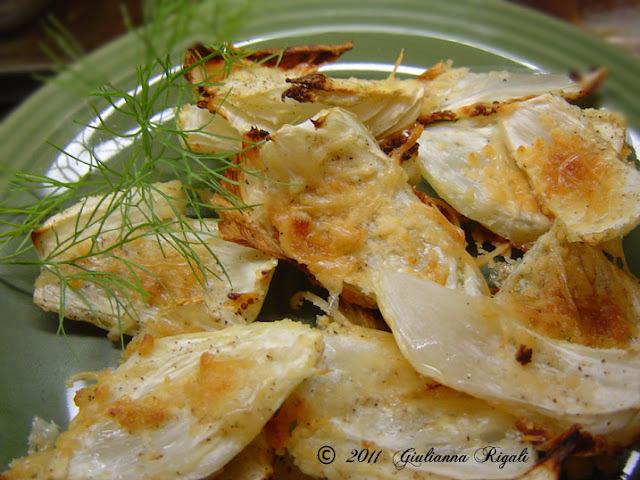 Fennel, also related to Anise, is a common ingredient in Italian cooking. The entire plant is used in varying ways. The bulb is eaten as a vegetable. Even the feathery leaves, sometimes called fronds, are used as vegetables or seasoning. Then you have the seeds which are used for seasoning, teas, and medicinal purposes. 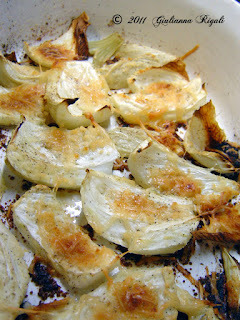 I really enjoyed roasting the fennel with cheese on it. The cheese was a nice pairing as it took the edge off the "licorice" flavor of the fennel, making it seem a little more of a vegetable than tasting like the black jelly bean that gets thrown in my trash can. 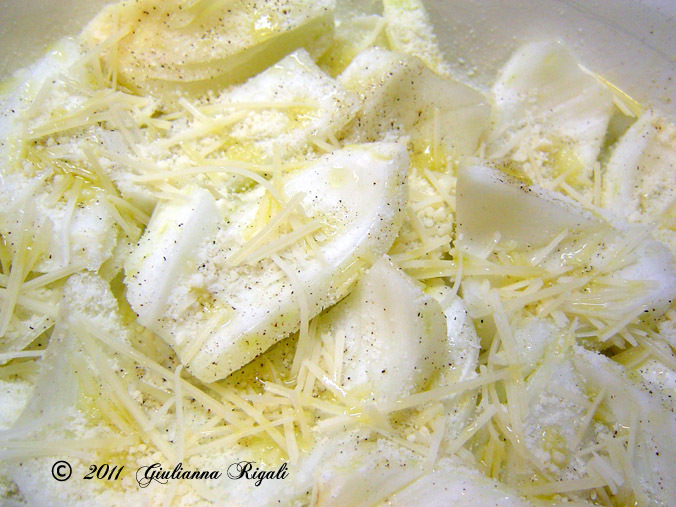 1/2 cup of Parmesan, Romano, and Asiago combined. Slice the Fennel bulb into serving size pieces. 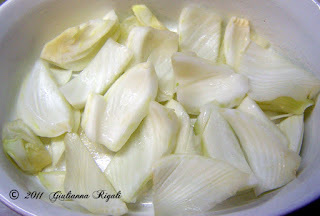 If you are not familiar with how to cut a fennel bulb, here is a great teaching video. When you finish cutting your fennel, be sure to soak it in an acidic water bath if you do not plan to use it immediately to keep it from turning an unappealing shade of yuck. I squeeze a little lemon into some water and it works wonderfully. Reserve your fronds for flavoring or decor if you so choose. I would chop a couple of teaspoons of the feathery portion to use on top. Otherwise, I do save a sprig as garnish! Now place your cut fennel into a olive oil sprayed baking dish, drizzle the tops of the fennel with more olive oil, season with salt and pepper and then sprinkle with the cheeses. 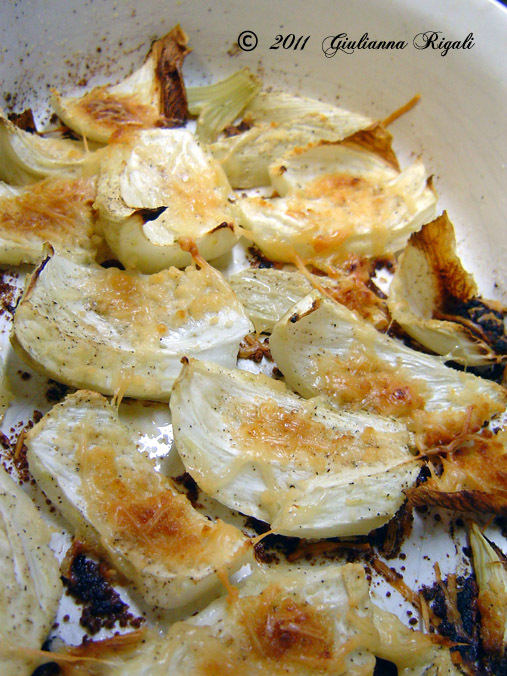 Roast until Fennel is tender when pierced with a fork and the cheese is golden brown. Sprinkle with Fennel fronds if desired. Serve as a side dish or appetizer.